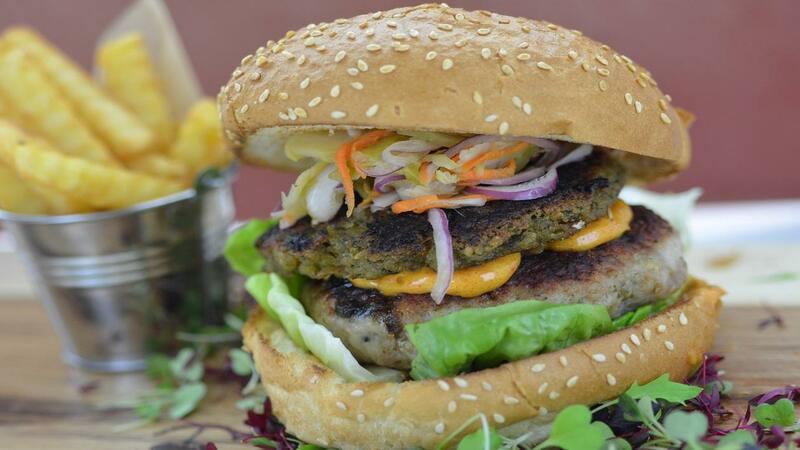 This burger will surprise your guests with its cranberry-turkey stuffing patties! And as a plus the relish will keep for at least 7 days and improves in flavour over time. Thinly slice the brussel sprouts and red onion then peel and grate the carrot. Bring the water, sugar and cider vinegar to the boil and add in the diced red chilli. Pour the mix over the vegetables then cover and allow to cool completely. Bring the water to the boil then pour over the dried cranberries and allow to rehydrate for 20 min. and allow to cool. Mix the turkey, sausage meat, COLMAN'S Sage and onion stuffing and rehydrated cranberries together. Shape the mix into 10 burgers and chill until needed. Grill the bacon until crispy and pour any juice into the HELLMANN'S Light Mayonnaise. Allow the bacon to cool then crumble into the mayonnaise and stir in the paprika. Bring the water to the boil then pour over the COLMAN'S Stuffing and allow to soak for 10 min. Shape the stuffing into 10 balls then flatten into patties. Grill the burger for 3-4 min. on both sides. Heat the oil and fry the stuffing patties for 2-3 min. on both sides until crispy. Spread a little of the bacon mayo on the bottom half of the bun then top with the lettuce. Place the cooked burger on top then a little more bacon mayo. Place the crispy stuffing pattie on top then spoon on the relish. Top with the other half of the burger bun and serve.